Given his terrible numbers among non-white and young voters, Trump may try to massively suppress Democratic votes. The 2016 electorate will be the most diverse in American history, with people of color comprising 31 percent of eligible voters, up from 29 percent in 2012. Despite his love for taco bowls, that’s bad news for Donald Trump. In the latest CNN poll Hillary Clinton is beating Trump 81 percent to 14 percent among non-white voters, a big reason she’s leading Trump 54 percent to 41 percent overall. Trump is faring worse among this key demographic than John McCain and Mitt Romney, who respectively won only 19 percent and 17 percent of non-white voters against Barack Obama. That’s a major reason Trump heads into the general election as a huge underdog against Hillary Clinton or Bernie Sanders. 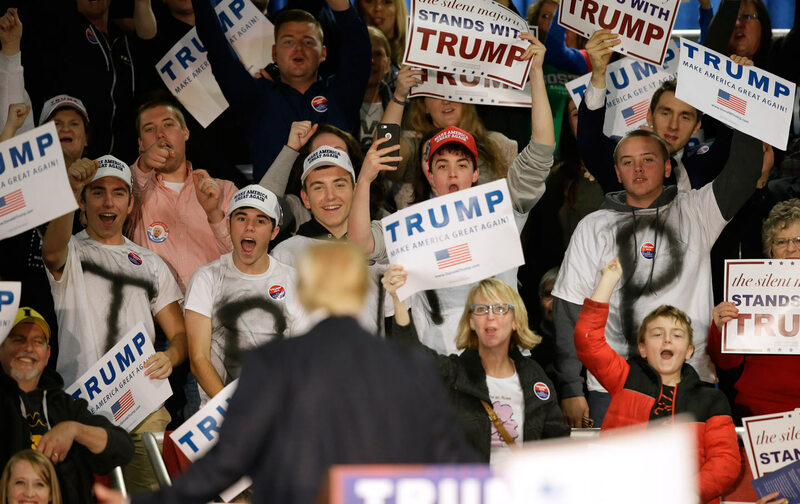 Trump supporters believe that he can turn out an unprecedented number of white voters, relying heavily on an analysis by Sean Trende of Real Clear Politics, who argued that there were 5 million fewer white voters in 2012 than in 2008 that lean Republican. 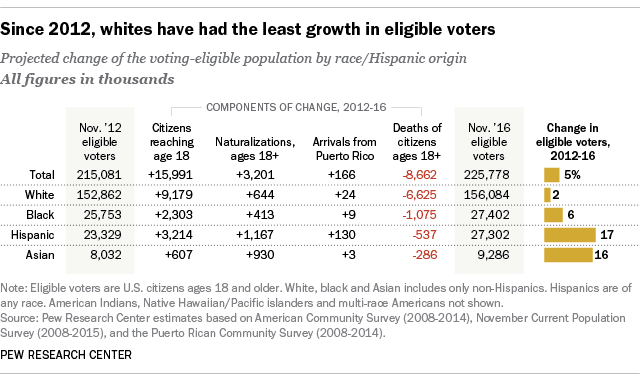 The problem with this analysis is that turnout declined among every demographic group in 2012 except for African Americans 55 and older, so there were 2.3 million fewer minority voters as well. Of the 10 million newly eligible voters in 2016, two-thirds come from racial and ethnic minorities who strongly oppose Trump, according to the Pew Research Center. Whites had the slowest growth among all demographics. Trump is also performing historically bad among young voters. Clinton leads Trump 61 percent to 25 percent among voters 18 to 29 in a new Harvard University Institute of Politics poll, seven points worse than the 32 percent McCain won in 2008, which was the poorest showing for the GOP since exit polling began in 1972. Unless there’s an unexpected turnaround in his terrible numbers among non-white and young voters, there’s only one way Trump can win the general election: by massively suppressing Democratic voters or hoping they don’t show up on Election Day. Trump could do this by supporting new voting restrictions adopted by GOP-controlled states (17 have new restrictions in place for the first time in 2016), urging his supporters to create chaos at the polls and running a breathtakingly negative campaign that demobilizes his opposition. Trump’s support in the primary directly correlated with racial resentment toward African Americans, Hispanics and Muslims. “The higher you scored on racial resentment, the more likely you were to support Trump; the more you resented immigrants or professed your white ethnocentrism, the likelier you were to plan to vote for Trump,” wrote Tom Edsall in The New York Times. It’s not a stretch to imagine Trump supporters trying to block these same voters from the polls. “I suspect that we’ll go from inciting violence at rallies to inciting violence at polling places rather seamlessly,” tweeted Jason Cherkis of the Huffington Post. Given his endless complaining about how the GOP primaries were “rigged” against him and the fact that his own kids couldn’t vote in New York’s primary because of the state’s onerous voter-registration laws, you’d think Trump would be sympathetic to the plight others face in trying to cast a ballot. But Trump has never been known for his empathy. “Well, you can’t expand the party that way,” Trump said, explaining that he opposed election reforms like Election Day voter registration, which would’ve allowed his kids to vote in New York. TODD: You know, you complained about the system a lot. I’m curious, are you now more open to same-day voter registration, allowing independents to vote in any primary they want? Are you going to be somebody that’s going to advocate for those positions now, to make it easier to vote, since your voters had a hard time? TODD: You realize that in New York, had there been same-day voter registration those people could have voted. So are you for that? TRUMP: Well, I’ll tell you what. But they said that they’ve never seen so many Democrats wanting to vote for Trump. They were by the thousands. And I will say this. On Election Day, we’re going to do very well in New York. But the people were saying to the press that they’d never seen anything like it. They’ve been there for 30 and 40 years doing this kind of stuff. TRUMP: No, no. I want to make the voting laws so that people that—it doesn’t make any difference how they do it. But I don’t think people should sneak in through the cracks. You have to have—and whether that’s an ID or any way you want to do it. But you have to be a citizen to vote. TODD: Well, of course. That is the law as it stands already. Trump makes the voting process sound like going to 7-Eleven and repeats debunked Republican talking points about non-citizens voting. But perhaps Trump knows more than he’s letting on. Studies have shown that restrictions like voter-ID laws can reduce voter turnout by 2 to 3 percent, with the largest drop-off among young, first-time and African-American voters. Already, many Republicans have admitted that such laws will help their party win elections, from Wisconsin Congressman Glenn Grothman (“I think Hillary Clinton is about the weakest candidate the Democrats have ever put up. And now we have photo ID, and I think photo ID is going to make a little bit of a difference as well”) to Heritage Foundation President Jim DeMint (“It’s something we’re working on all over the country, because in the states where they do have voter-ID laws you’ve seen, actually, elections begin to change towards more conservative candidates”). Suppressing votes may not be enough to save Trump, but it doesn’t mean he won’t try. Recent history suggests that we should expect the worst from his campaign.